Just a quick post today, mainly for record-keeping purposes and to keep me in the running for the Jaywalker KAL. Obviously, this pattern has been vexing me. I suppose I should expect difficulties with a pattern named Jaywalker: someone who is willfully breaking the law. Anyway, I did get one sock finished over this past weekend (yay for me!) and the second one is cast on. 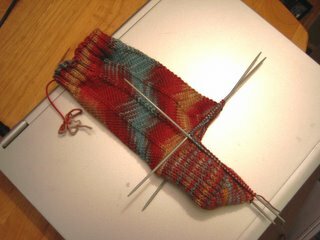 Not much done on sock #2 right now, but I will keep working diligently. Am I a dork because I got excited about receiving an email from Wendy of Wendyknits? (She responded to a comment I left via email.) Am I a dork because I use the word dork? I’ve been spending more time blogging and looking at (mostly knitting) blogs lately and I’m struck by the level of artistic talent out there. I’m referring to the skills that go into not just writing but also designing visually appealing blogs; good (if not great) photography and graphic design, and; fabulous knitting. Me, well, I’m a dork, remember? I never went to art school. I learned to color within the lines and to draw stick people, trees, and turkeys by outlining my hand. I can appreciate good design when I see it, but I’m damned if I know how to do so myself. I’m not visually clever. I would never refer to myself as artistic at all. I am in awe of you people! Who do you think you are, Jaywalker? Let’s get this straight: I’m the knitter. If it weren’t for me, you wouldn’t even be here. You better straighten up and fly right, buster. Or else. Sure. Like you’ve never talked to your knitting this way. Or at least you’ve wanted to. Admit it. It occurred to me that I have no buttons on my blog. So, I’m out to remedy that today. I mean, what’s a blog without buttons, right? It seems so…naked, right? 2. For the past two years I’ve been a donor to Doctors without Borders, and therefore sort of a member of Knitters without Borders. I say “sort of” because I never emailed the Yarn Harlot and let her know that I’ve been donating. Today I remedied that, and am now honored to be officially eligible to put up a TSF button. 3. I sent the Yarn Harlot a “twofer” email and signed up for the Knitting Olympics at the same time. I’ve been thinking a lot about this decision and I believe I’m ready for the challenge. I will be competing for Team USA by knitting my first pair of gloves. I had thought about doing something else, but decided that the gloves would be enough of a challenge AND I would be making progress on completing one of the two pairs I promised to do after Christmas (one pair for my mother, and the other pair for my stepfather). I’m competing against masters here in…buying yarn. Since I really need more of it. Right. And now, several hours later, I am back to just picking up the gussets. I had somehow ended up with a LARGE float of yarn across the heel and had to tink back about 10 rows. Actually, Jamie did most of the tinking for me. Thanks to the knitting gods for giving me such talented friends! Well, I made it back from Cleveland in one piece and I finally got my pedicure, too. Woohoo!! Even though I was in a nice, comfy hotel, I slept poorly Friday night. I was quite exhausted when I made it back home, but still had to keep some appointments and commitments. So, it was no surprise when I fell asleep in the chair during my pedicure. I roused briefly to give my approval of a polish color and again when the woman finished up and told me I’d need to give it about 10 more minutes to dry. No problem; I awoke about 15 minutes later and groggily put my socks and shoes on. The ladies at the spa could really tell I needed the rest, apparently. 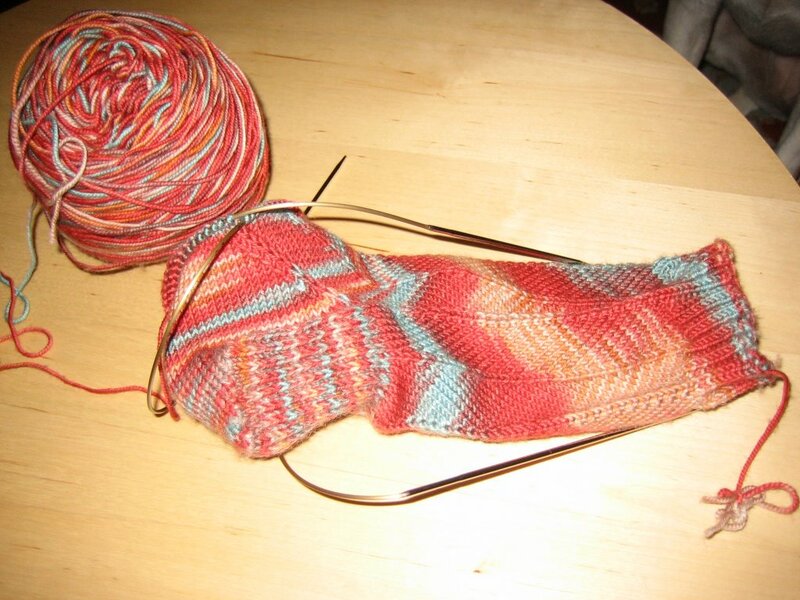 I knitted on my Jaywalker sock last night for a little while. I haven’t been getting a lot done on the sock this weekend, so I’m not posting any more “in progress” photos. More importantly, I’ve tried it on a few times and I think it will fit just fine this time. 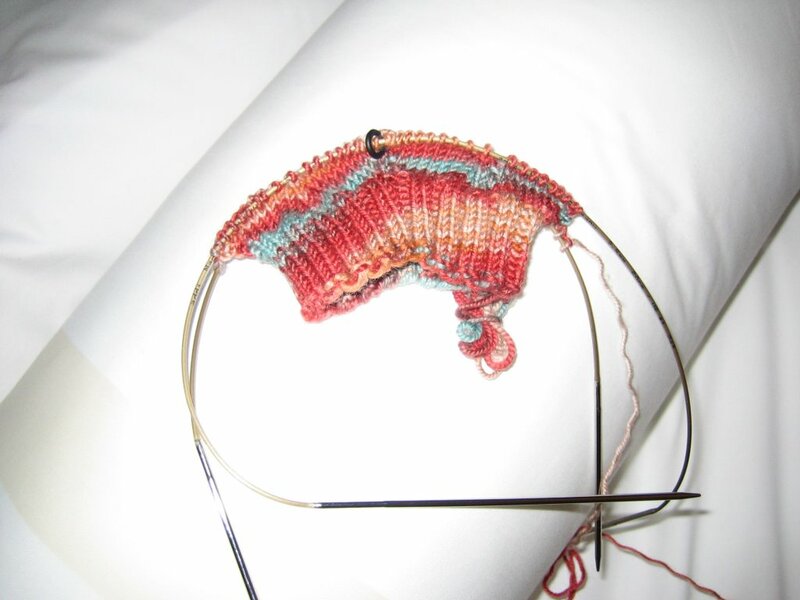 I’m nearly ready to work on the heel. I know this may sound a bit weird, but I think I’ll run a life line through the stitches just before I start the heel. I plan on using some reinforcing yarn like I did on attempt #1, and I’m a bit concerned that may contribute to making the sock really tight. When I use reinforcing yarn it really makes for a sturdy heel, but some flexibility is sacrificed. Today Jamie and I went to Loopy Yarns together. It was a fun outing that involved lots of yarn fondling and a stop at a coffee shop for some caffeine and a bit of knitting. While I did get the needles I needed at Loopy (ostensibly the reason for the excursion), I was also happy to pick up this new knitting bag. Doesn’t it look professional and stylish? After my second business trip in as many months and with a third coming up soon, I’ve realized I have to do something to make it easier to deal with the TSA regulations limiting a person to only two carry on bags, including a purse or briefcase. I usually tote my laptop around in a backpack when I’m traveling to and from the office. However, the backpack doesn’t have much extra room, and I’m just not comfortable with carrying my cash, credit cards, and IDs on my back. 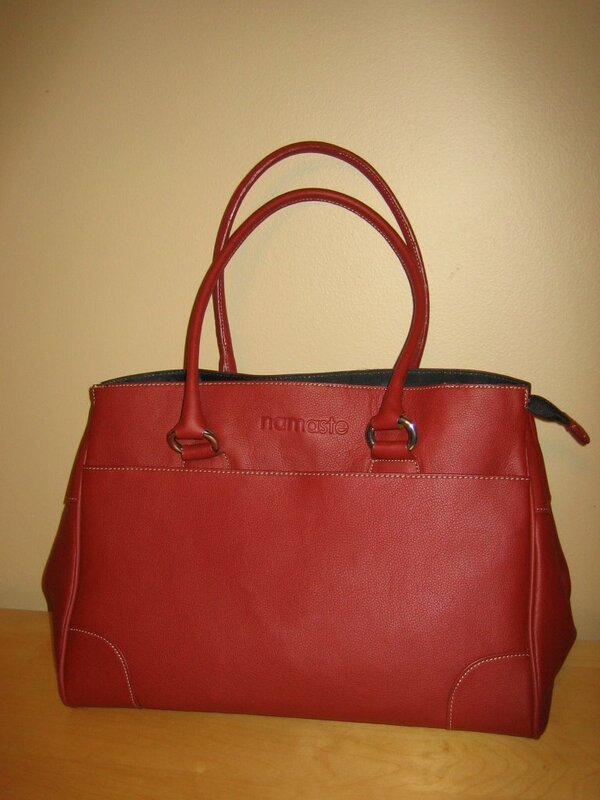 I’ve noticed that many of the women professionals are carrying totes similar to the one above as their purse/laptop bag. It will fit under the seat in front of you on the airplane, you can easily slip the laptop in and out of the bag at security check points, and you can fit your entire purse (if it’s a small to medium sized one) or wallet in it, too. In my case, I can also slip in some travel knitting! When I’m not traveling for work, I can fill the entire bag with knitting projects. Yay! Mark and I watched Vera Drake while I knit last night. It was a very powerful and well-acted movie set in 1950’s England. Vera “helps girls” who find themselves “in trouble” (in other words: with an unwanted pregnancy.) Today as I sit here catching up on my blog-reading, I find out that it’s Blog for Choice Day. I’m pro-choice and quite disturbed by the slow and steady erosion of a woman’s right to choose in so many states. The PBS program Frontline took an indepth, frightening look at the strategy of anti-choice rights groups in a recent documentary. Follow the link and view it online if you haven’t seen it yet; it’ll open your eyes to the amazing tactics by these groups. When I was just out of high school, one of my friends had an abortion. She was 18 years old and while she was seriously dating a guy, she wasn’t ready to have a child. After she had the abortion, she told me she could understand why some people are against it and that no woman should go through such an experience. I was shocked that this friend would suddenly become anti-choice. It took some time and much questioning for it to become clear that she hadn’t exactly changed her mind, but the experience had affected her so deeply that she came very close to doing so. Only a few months later she intentionally became pregnant. She and her guy married, had two children, and eventually divorced. While I’ve never had to make this choice, I’m glad that I can. And I’m glad that other women in my state can, too. We should be able to make a choice about something that affects our bodies and our lives. Enough said. Greetings from Cleveland! Here I sit, in a hastily booked hotel room, experiencing a second quiet night by myself. I should be at home right now, getting ready to enjoy a bottle of wine and some homemade pizza with my husband. That’s my usual Friday night, and I like it very much. But the weather is not cooperating. Today I was working in Cleveland on a project. As I was walking out of the office this afternoon, I received a call on my mobile phone. The charming robot voice informed me that my flight had been cancelled and that I was successfully re-booked on another flight…one that leaves early tomorrow morning. After a 30 minute consultation with a corporate travel agent getting apprised of the situation in Chicago airspace, it was confirmed that this was my best option. So, here I sit back in the hotel I so enjoyed last night. Hey, at least I have a comfy bed and I’m not trying to sleep in the airport, right? I’m wondering if this has something to do with my pedicure. I’m convinced that I’m totally doomed when it comes to getting a pedicure. Recall that I was supposed to enjoy a pedicure last Monday, but it had been accidentally double-booked. That was actually my second attempt to schedule one within the past month. The first one couldn’t happen due to scheduling conflicts, too. So, I booked a pedicure for 8 AM Saturday morning. My flight from Cleveland won’t get me back into Chicago by 8 AM. I’ve had to reschedule yet again! My Jaywalkers are likewise delayed. Here’s where I was Wednesday night. While travel can be a pain in the *ss at times (like when you get stuck out of town on a Friday night when you should be at home snuggling with your husband and pets), it is great for working on knitting. All that sitting at the gate and on a plane gives one lots of time to knit. So, I was able to get several inches into attempt #2 on Jaywalker. Last night in my hotel room, I tried it on. Not snug at all! But…now it was too loose. So…I ripped it out again. Completely out. I cast on again at the smaller size. I knit the ribbing on the 2.25 mm DPNs. Then, I switched to the Addi Turbos, which are actually 2.5 mm. (Yes, I was a bit surprised to see that clearly marked on the package…2.5 mm, not 2.25 mm.) I’m hoping that the little 1/4 of a mm difference will make the stitch gauge a bit looser. We’ll see. So now, I’m just now getting going again on attempt #3. Let’s hope the third time’s a charm in this case. I’m making decent progress, aren’t I? I can’t help but feel that I should have more than this done, though. The plan for today was to take Hannah to the veterinarian in the morning, start dinner in the slow cooker, then finish the heel on Jaywalker sock #1. 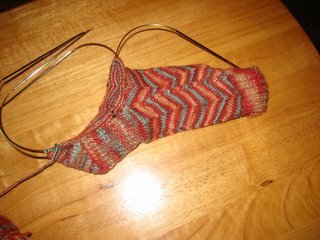 I wanted to have the heel finished and the gussets picked up by the afternoon. I wanted the sock all set up for some easy knitting while I was relaxing at the spa this afternoon enjoying a pedicure. This was to be my treat for the day. Alas, today was one of those days where nothing quite worked out as planned. There were little chores to do at home that I hadn’t counted on. But, I did manage to get the heel finished in time to make my spa appointment. Then, I arrived at the spa only to find out that there had been a scheduling error. Somehow, my facial and my pedicure had been scheduled in the same time slot an hour hence. Nothing could be done to fix it, so I left to run a few errands and came back an hour later for my facial. No way to knit and get a facial at the same time, so sock #1 is a little less developed than I’d hoped. Damn. 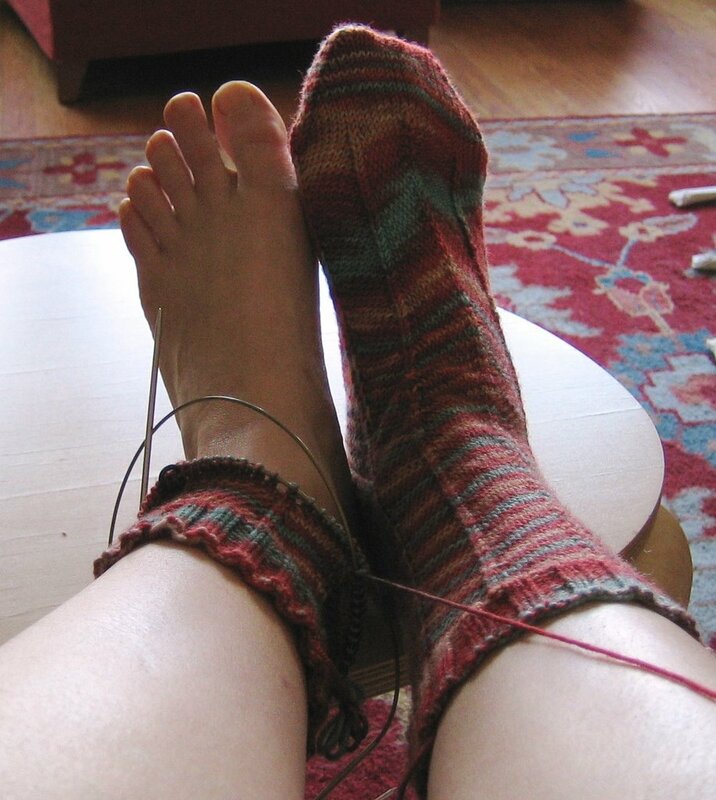 I had really hoped to have enough done that I could try it on and admire my sock knitting prowess and my pedicure. That would have made a nice photo for the blog, eh? Brokeback Mountain just won the Golden Globe award for best drama. Quite the tear-jerker, and very deserving of the award. This weekend, we rented Grizzly Man, a documentary about Timothy Treadwell and his “mission” to protect a population of grizzly bears in Alaska. I’m still thinking about this movie and highly recommend it.